Either fill in the form opposite for a phone call off one of our stairlift experts, or alternatively call us using our free phone number, 0800 834 730. One of our customer service representatives will discuss your requirements and options with you. We will then send you an information pack or arrange a no-obligation visit by one of our friendly home mobility consultants. Our consultants will carefully assess your requirements and guide you through the whole process. If you decide that a Brooks stairlift is the right choice for you, one of our fully trained installers will come to fit the stairlift within a couple of days, sometimes as little as 24 hours, and will have your stairlift installed within an hour of knocking on your door. 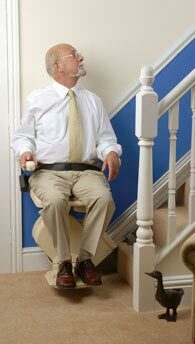 Our installers test the stairlift fully and ensure that you know how to work it before leaving it in your capable hands. They leave no mess: 30,000 stairlift installations have ensured we can act quickly, accurately and with the minimum of disruption to your daily routine. And in the unlikely event that you have a problem with your stairlift, even if it's the simple fact that you've forgotten how to work it, our team is just a phone call away.